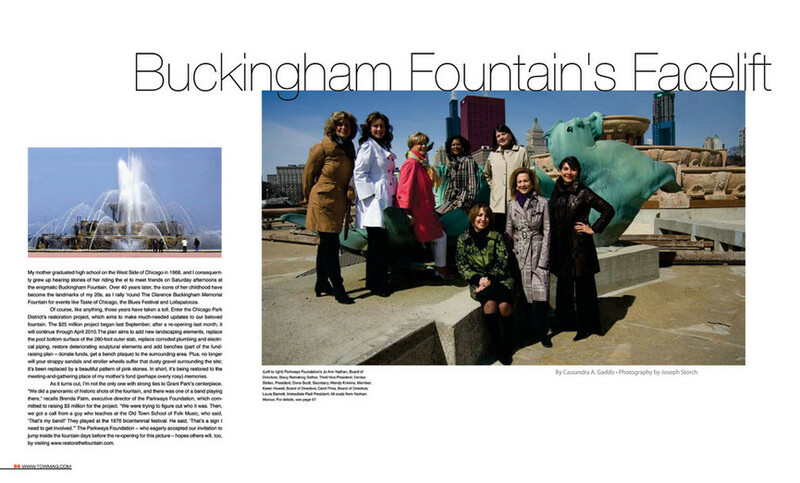 My mother graduated high school on the West Side of Chicago in 1968, and I consequently grew up hearing stories of her riding the el to meet friends on Saturday afternoons at the enigmatic Buckingham Fountain. Over 40 years later, the icons of her childhood have become the landmarks of my 20s, as I rally 'round The Clarence Buckingham Memorial Fountain for events like Taste of Chicago, the Blues Festival and Lollapalooza. Of course, like anything, those years have taken a toll. Enter the Chicago Park District's restoration project, which aims to make much-needed updates to our beloved fountain. The $25 million project began last September; after a re-opening last month, it will continue through April 2010. The plan aims to add new landscaping elements, replace the pool bottom surface of the 280-foot outer slab, replace corroded plumbing and electrical piping, restore deteriorating sculptural elements and add benches (part of the fundraising plan - donate funds, get a bench plaque) to the surrounding area. Plus, no longer will your strappy sandals and stroller wheels suffer that dusty gravel surrounding the site; it's been replaced by a beautiful pattern of pink stones. In short, it's being restored to the meeting-and-gathering place of my mother's fond (perhaps overly rosy) memories. As it turns out, I'm not the only one with strong ties to Grant Park's centerpiece. "We did a panoramic of historic shots of the fountain, and there was one of a band playing there," recalls Brenda Palm, executive director of the Parkways Foundation, which committed to raising $5 million for the project. "We were trying to figure out who it was. Then, we got a call from a guy who teaches at the Old Town School of Folk Music, who said, 'That's my band!' They played at the 1976 bicentennial festival. He said, 'That's a sign I need to get involved.'" The Parkways Foundation - who eagerly accepted our invitation to jump inside the fountain days before the re-opening for this picture - hopes others will, too, by visiting www.restorethefountain.com.